PALO ALTO, Calif. (KTVU) - Palo Alto police are looking to identify a suspect who robbed a bank on California Avenue Monday evening after showing a note to the teller. The suspect fled on foot and remains at large. At 5:28 p.m., Palo Alto police dispatch received a report of a bank robbery that had just occurred at the Wells Fargo located at 505 California Avenue. Officers responded and a search was done with a police canine, but the suspect was not located. 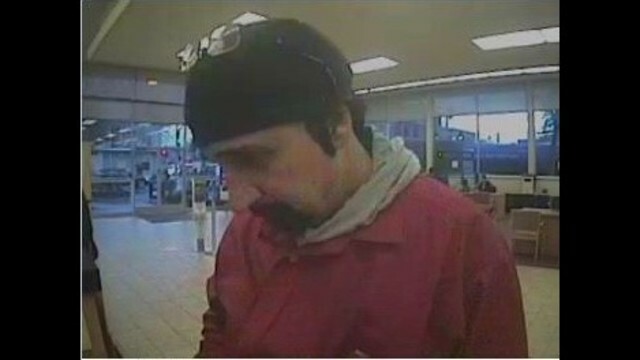 The investigation revealed the suspect entered the bank and presented a note to a teller demanding money. The teller gave an undisclosed amount of money to the suspect. The suspect then left the bank and was last seen walking northwest through the parking lot of 550 California Avenue. No weapon was seen by the bank teller, and no one was injured during the robbery. The suspect is a white male, about 5 feet 10 inches tall with a medium build. He was wearing a red rain jacket with a gray hooded sweatshirt underneath, and dark pants. The suspect was wearing a black beanie with eyeglasses resting on his head. He has brown hair and a goatee. Two images of the suspect were captured by surveillance cameras. The last time a bank robbery occurred in Palo Alto was in 2017. Anyone with information about this incident is asked to call Palo Alto police at 650-329-2413, e-mail at paloalto@tipnow.org, or text message to 650-383-8984.